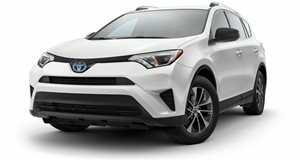 The 2018 Toyota RAV4 Hybrid is powered by a 2.5-liter gasoline engine and two electric motors that produce a combined 194 hp, a CVT transmission powers all four wheels. Performance is acceptable although fuel economy is excellent in a gasoline power dominated segment. A comfortable ride and commodious interior are let down by average material quality. Standard safety systems are commendable with even the base LE Trim getting lane departure alert with steering assist, automatic high beams and adaptive cruise control. Even more safety devices as well as navigation and power seats are available on higher trim levels. The crossover is one of the fastest growing segments around, the allure of a higher ride height and a practical cargo area without having to stretch to a larger SUV seems to resonate with a lot of shoppers. Fuel efficiency tends to suffer compared to smaller cars though and hybrid offerings are rather thin on the ground. The 2018 Toyota RAV4 is one of the few crossovers out there with a hybrid drivetrain option and it offers a potentially desirable mix of efficiency and practicality. The recent 2016 redesign saw an improvement in interior design although the level of materials used in the cabin are not quite up to some of the better finished rivals in this segment, the Mazda CX-5 being a particularly high-quality example. Controls and switchgear can be a bit plasticky too but the build quality is generally good. That said, the interior is roomy and occupants in the front will have no trouble getting and staying comfortable on longer trips. The rear seats are spacious enough for two tall adults although leg room can be a bit tight if tall front passengers push their seats all the way back. The trunk is slightly shallower than in the gas-powered RAV4 but few would notice, the rear seats also fold down so cargo space is decent. The RAV4 is not going to set your hair on fire with its engaging dynamics and exciting handling but few shoppers are going to be looking for these traits in their crossover. What it does offer is class-leading refinement and a very good ride quality. The gas-powered RAV4 trails the segment leaders in acceleration figures although the good news is that the hybrid version is slightly quicker. The RAV4 Hybrid is fitted with a 176 horsepower, 172 lb-ft of torque 2.5-liter gasoline engine and two electric motors that combine to offer a total of 194 hp. A continuously variable transmission (CVT) powers all four wheels. 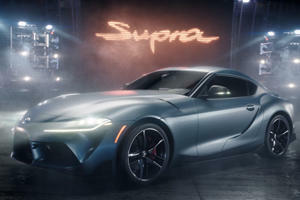 The 0-60 mph time is in the low 8-second range which is still slightly behind the best in class but the electric motors provide strong throttle response and there is ample power for most overtaking maneuvers. The real benefits are to be found with the much-improved fuel economy figures, the city/highway averages of 34/30 mpg are commendable and while the highway consumption remains similar, the gas-powered RAV 4 only manages 23mpg in city driving. There are four trim levels to choose from, LE, XLE, SE and Limited. The base LE comes equipped with dual-zone climate control, reverse camera, 6.1-inch touchscreen with integrated Bluetooth streaming and smartphone capability, 6-speaker audio system, cruise control, 3 selectable driving modes, fixed center console, 17-inch alloys and keyless entry. Safety devices now include the Toyota Safe Sense package as standard which includes pedestrian pre-collision detection, lane departure alert with steering assist, automatic high beams and adaptive cruise control. XLE Trim adds a leather-trimmed steering wheel, upgraded touchscreen and can be equipped with the hybrid Convenience Package which includes blind spot monitoring, rear-cross traffic alert, surround parking sensors, navigation and a power liftgate. SE Trim includes all of the above and offers 18-inch wheels, 8-way power driver seat with seat heating for front occupants, simulated leather upholstery and SE specific design details. An Advanced Technology Package is available for the SE with includes a bird’s eye view camera, premium JBL audio system and surround parking sensors. The top Limited Trim adds a 7-inch touchscreen, auto-dimming rearview mirror, leather-trimmed shifter, memory function for driver’s seat, sliding center console and can also be specced with the Advanced Technology Pack. A hand’s free foot activated power liftgate is a unique option on the Limited trim. The 2018 Toyota RAV4 sits somewhere in the middle of a tightly contested compact crossover segment. 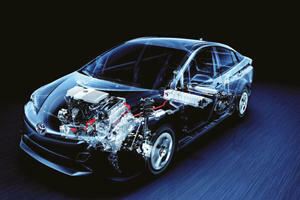 The addition of a hybrid drivetrain enhances performance while drastically reducing fuel consumption in city driving. A spacious interior and comfortable ride add to the RAV4 Hybrids appeal and only mediocre interior materials and a less-than exciting driving experience mark the package down.